The blinds were already half drawn by the time I arrived for dinner at the Spires at the corner of Willow and Lakewood on its last night in business. 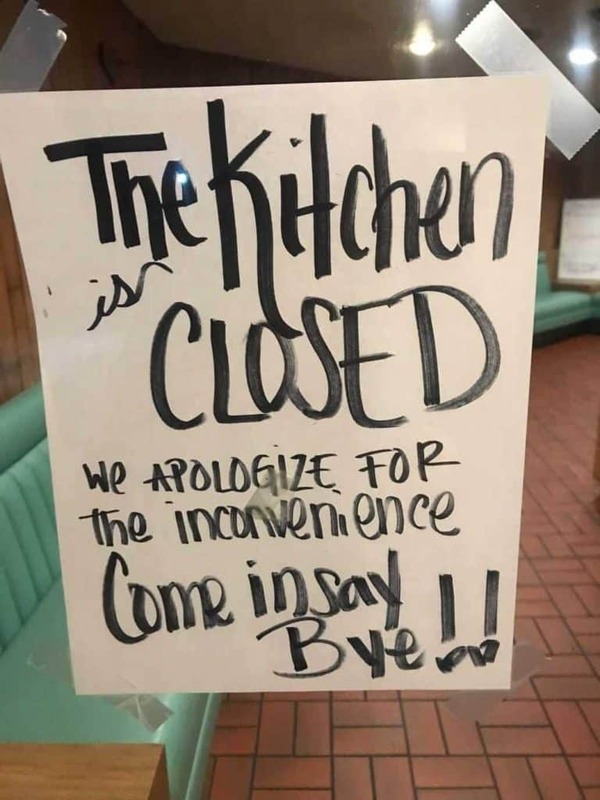 By 7 p.m., on Sunday, Jan. 27, the once 24-hour kitchen ran out of food and the sad stragglers, too late for a final meatloaf goodbye, were milling about in the waiting area, telling the server trying to settle up the last till of forever, how much they’re going to miss this place. With all the kindness you’d expect from extant diner staff, she listened to their stories (“It was back when Jimmy Carter was President!”) and answered their questions (“Yes, the one on Del Amo is still open”), allowing their nostalgia to drift back to a time when family-owned greasy spoons were king of our suburban landscape and not the latest generational change on the chopping block. The last few customers grabbed the plastic-sleeve menus as keepsakes on their way out. Then, I saw them: the last two pie slices in the restaurant’s 54-year-old history. Filled with neon purple goo, they twirled slowly and silently in the glowing cake fridge. I asked the server if I could buy them—my friend and I were truly hungry, anything would have helped—and offered to take them to go. “You can sit at the counter,” she said without hesitation, motioning to the empty teal seats to her right which, for decades, served as a gathering place for the neighborhood’s regulars, mostly seniors who doted on Spires’ legendary recession-friendly pricing. I slid into a swivel stool and gave the sea foam green vinyl seat one last smoosh. As if on instinct, I peered towards the darkened service station and asked if there was enough left for a cup of coffee; from the temperature of whatever was in the half-full pot I saw, the warmer had been off for over an hour. With the kitchen dark and most of the machines already turned off, the server brought the last order of pie this Spires location would ever know cold, no a la mode, a green frill toothpick staked atop. It was boysenberry, or maybe blackberry, or maybe just a generic-berry-flavored filling that tasted like it would serve well on a stack of Spires’ fluffy plate-sized pancakes. I closed my eyes and imagined it was. It’s easy to overlook the subtle art of a 24-hour diner and hard to replicate the role places like it fill in the lives of its customers. I gained a soft spot for the genre as a sad-punk teenager trying to never go home by taking up space at whatever sit-down breakfast-all-day place would have us. But I only really grew to understand their importance (and my teenage obnoxiousness) when I spent several years of college working the graveyard shift at one just over the Orange County line. Even though a lot of the gig was serving drunks chili cheese fries and one-pound omelettes, I also poured a lot of cups of (hot) coffee and spent hours talking and listening and talking and listening to sober regulars at a long counter with vinyl swivel seats and a window into the kitchen just like the one at Spires. When the stumblers trickled out at Harbor House, the early morning squad would arrive, a crew of retirement-age folks who had made the place their daily breakfast table long before I got hired to restock napkins. They were an increasingly rare breed—those who prefer to meet new people, converse about the day’s local news and order homestyle sustenance at a Real Life Diner instead of through their phones. And not just any old diner will do. When the Hof’s Hut on the corner of PCH and 2nd Street closed in 2013, regular customers—some in motorized wheelchairs—gathered outside to protest the loss of their beloved restaurant. They begged the owners not to send them to one of the other Hof’s, not because the other locations were sub-par, but because it wasn’t their Hof’s (the Bixby Knolls location burned down in 2015). As with the systematic dismantling of Hof’s Hut, the closure of one of Long Beach’s Spires is another indication of rapid changes happening in the restaurant industry. The PCH Hof’s was immediately razed and within a year had been replaced with Lucille’s Smokehouse Bar-B-Que, a casual fine dining chain also owned by the Hoffman family’s restaurant group. The lot that Spires is on will soon be home to a Starbucks and a Jack In The Box, both of which were granted drive-through permits through the city last June. “We’re closed now, but you can stay here and take your time,” our server said as she handed me a bill for $6.48. There was one other person drinking lukewarm coffee at the counter with us and three generations of a single family filling the last booth, Grandma’s walker at tableside. The remaining employees, who were now officially out of a job, started doing side work on instinct before realizing it didn’t matter. A plastic handle of unopened maple syrup sat on one end of the stainless steel counter. An 86 list from earlier in the night listed items scrawled as they ran out: “salmon,” “steak,” “liver and onions,” “bbq pork ribs,” “onion rings” and “chicken.” Three plastic-wrapped cinnamon rolls sat leftover in a plastic dome. In the kitchen, the chef kept his white hat on as he placed plastic over the top of his prep area one last time. 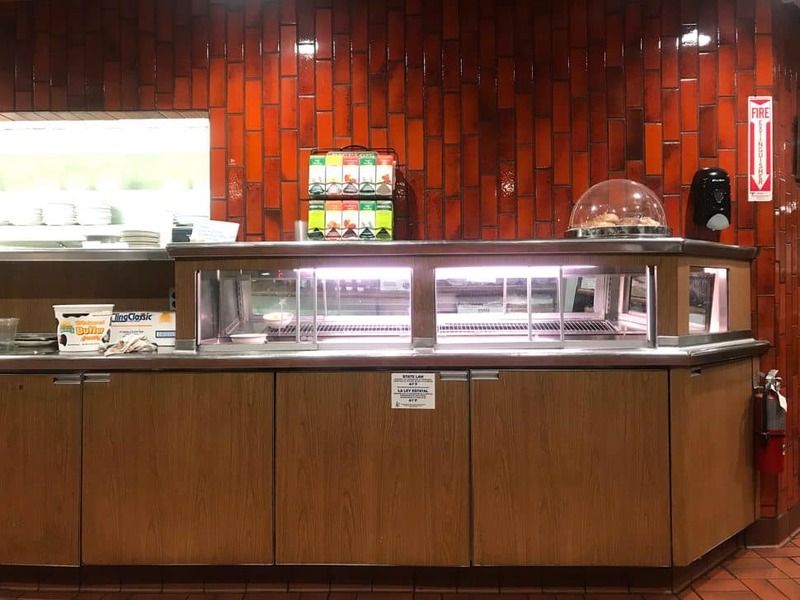 The server turned off the pastry display case behind the counter, then the pie fridge below, the hum abruptly stopping and numbing the room, as if it was hearing silence for the first time in 54 years.